This review is about item#3431251. It was very easy to use. Even if it is higher than a high product, it does not change. . This review is about item#3431303. There are many types of wire diameters and the place to choose according to the usage content is good. This review is about item#03431197. 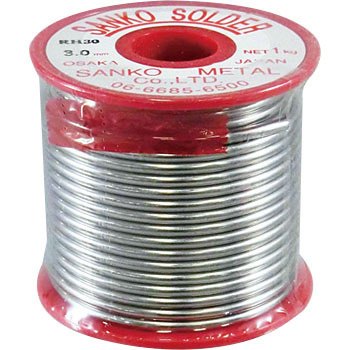 I used this solder (3 mm) when making a shield case using a tinplate. The ironing is 100W. The flux of solder was rather large, but wetting was not very good. As a matter of fact, using monoterror solder (09151511), it is easy to use familiar very well. Flux is less, but the finish was clean and the work was easy. This review is about item#3431197. This review is about item#3431312. In general, I think that it is the cheapest as a solder with 3 mm caliber with a small number. Even at other homepages, there is no such amount at this price. This review is about item#03431285. I bought a small amount of thread solder, but I bought 200 g of this because it got lost quite quickly. 1000 yen I am satisfied that I can buy an amount that is comfortable for a while. From now on, it is decided by this! This review is about item#03431303. It is very smoothly solderable. This review is about item#03431251. It is ordinary solder. We introduced a high power gas type soldering iron and purchased a thicker one than before. I did not use it for detailed work so I thought it might be a bit thicker but I am satisfied with this. Conventionally, the used product was unavailable, purchased this product with the same weight and price as affordable. I am satisfied with the use, I am no different from anything so far. Since the flux is not included in the information of the product number list screen, I assumed it and purchased it. However, since the actual thing was flux entering, it does not suit the purpose and can not be used. It is not a non-refundable item so it will not make you fall asleep. It was a very bad afterthought shopping. Solder with a wire diameter of 3 mm was hard to obtain recently, and I found it by clicking on the monotalous place I was in trouble. I was lucky. Although the brand was Esco, the manufacture is "SANKO METAL" of a professional manufacturer. The quality of solder as well as the finish was satisfactory enough.